In this New Year, I will strive to post at least one blog entry each month. 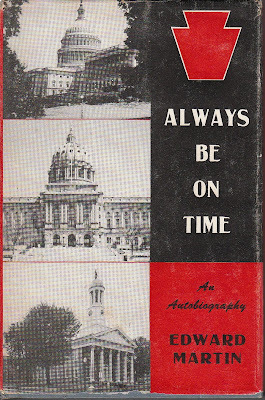 This first title, "Always Be On Time," will be an appropriate reminder for me. 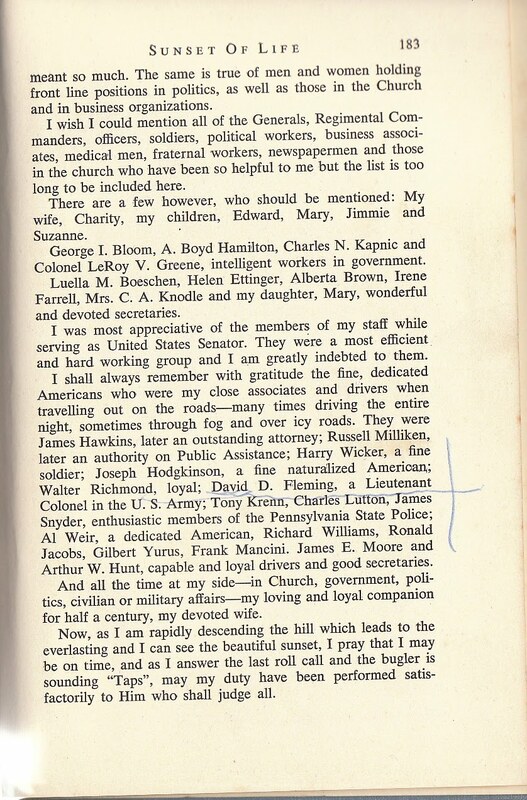 For My Sentimental Library Collection, I collect books formerly owned by authors, bibliophiles, and other famous people. 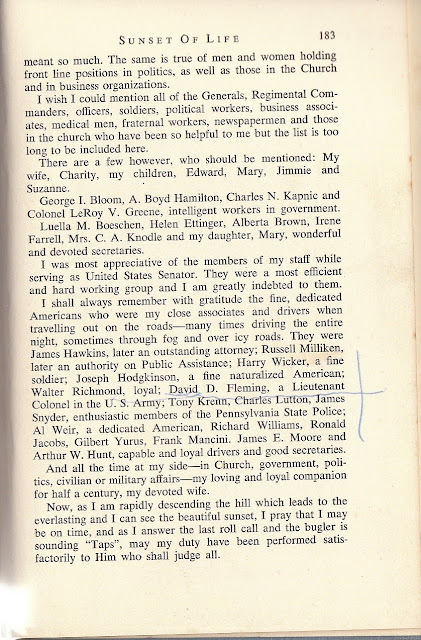 I also want books written by or about them, bookplates if they have them, catalogues of their libraries if such were published, and autograph letters either to or from them. 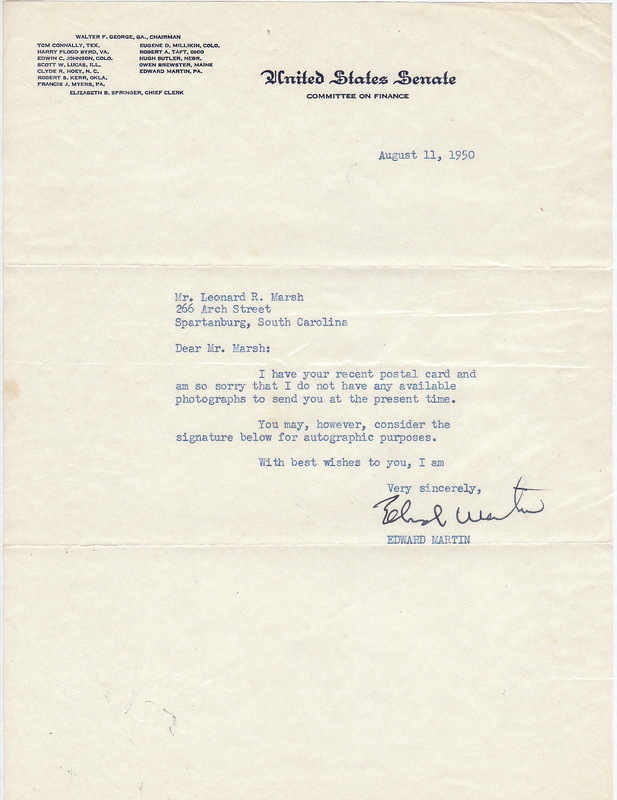 Usually, I look for books formerly owned by authors I collect, and then try to complete the cycle of acquiring bookplates, catalogues, and autograph letters. 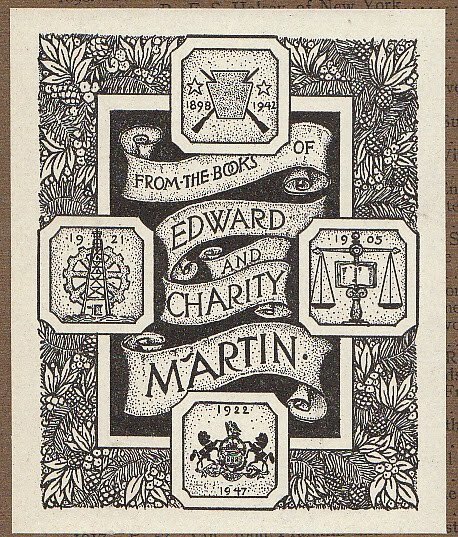 In one case, however, it was the bookplate that got me started first. And I didn't know the owner of the bookplate from Adam. In 2004, I wrote an article for the now defunct online periodical, AB Bookman's Magazine. My article was titled "The Story of a Bookplate." If you haven't read this article before, you should read it now. It provides background information for this blog entry. The bookplate was pasted on the inside cover of a pamphlet commemorating the Battle and Massacre of Wyoming, Pennsylvania, July 3, 1778. 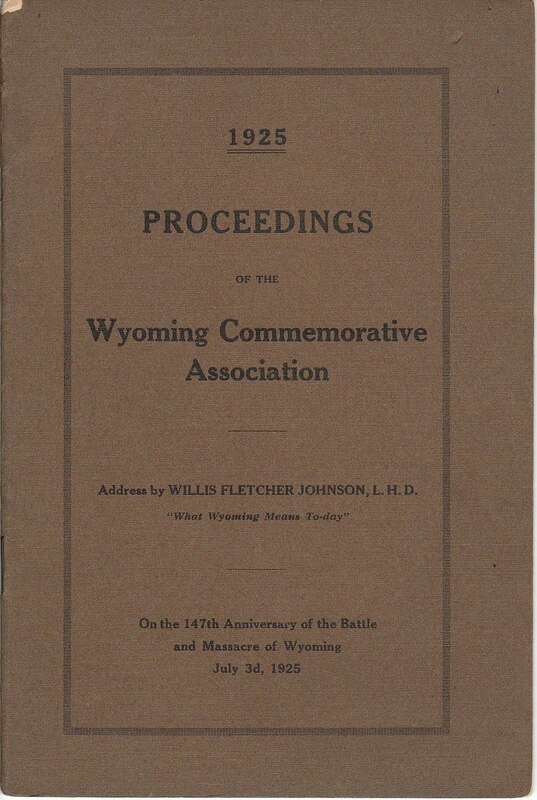 I don't remember exactly where I acquired the pamphlet; there were two commemorative pamphlets, but I gave one to "fellow" collector, Jan Clark. I may even have bought the pamphlets specifically because of the bookplate. I have done that in the past. 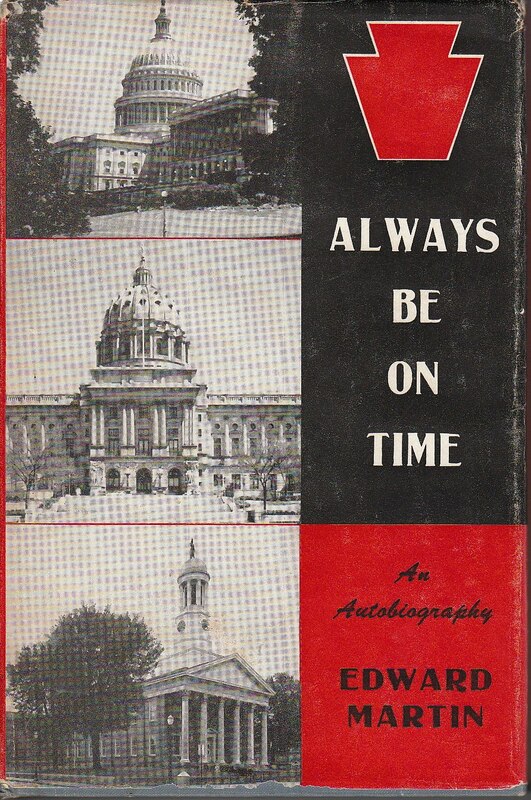 I kept track of the copies of Edward Martin's autobiography, Always Be On Time, available online, but was unwilling to pay $75 for a copy. But in June 2009, one of the booksellers had a 50% off sale, and you can guess what I bought. Edward Martin inscribed this book "For David D. Fleming – A fine and loyal American – with appreciation – Edward Martin, 31 Dec 62." 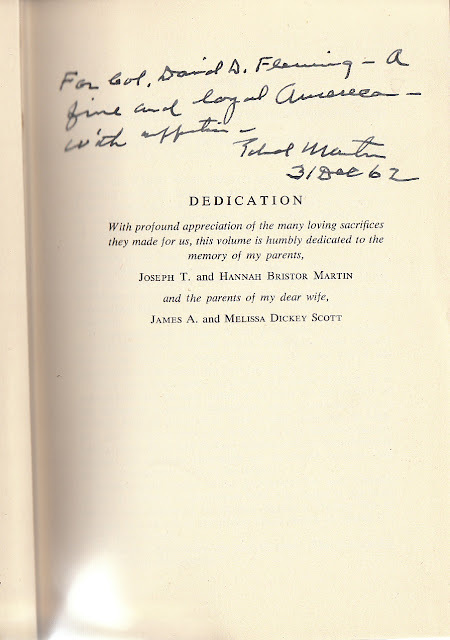 This book title is part of a motto Edward Martin's father practiced and preached: "Be on time, be loyal and speak the truth." Edward Martin lived by that motto himself, as a general, as a governor, as a senator, and as a man. I wish there were more politicians like him today. We need them. Here is a picture of Senator Martin. I started reading Edward Martin's book soon after I acquired it in 2009, but somehow got sidetracked. I started reading it again this week. In all my twenty-three years in the military, I never witnessed a General marching with his troops. That is General Martin leading his troops in formation. Why the sudden interest in Edward Martin? 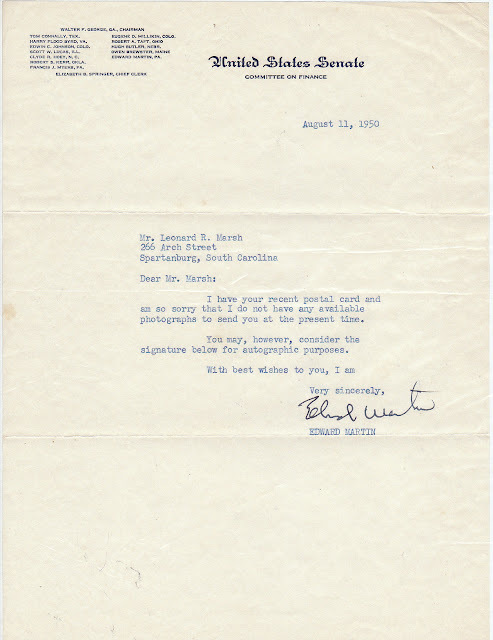 The last thing I bought in 2010, on December 31st no less, was a Typed Letter Signed (TLS) by Edward Martin. I acquired the letter from Linda Harris, an ebay seller from Spartanburg, S.C. I don't believe there is a catalogue of Edward Martin 's library–a photo of his library will have to do. I have, therefore, completed the cycle for My Sentimental Library! And a Happy New Year already! While some collectors seem to like to get books with no visible indication of prior ownership (until time machines become common), there is definitely a place for a collection like the one you are assembling, especially when it is something that was owned by someone significant. These remind me of association copies or signed books in that you can be fairly sure that the person of interest actually held the book in their hand. The book becomes a way to get closer to that subject. Since I am also a genealogist, I have subscriptions to resources like Ancestry.com ($300/yr for the full world-wide subscription). I have used this with success when looking up info on names I find in books. This works best when there is an unusual first or last name or a location can be associated with the name. Census records up through 1930 are presently available and I trust the 1940 will be available in a year or two (72-year rule).